Clearly I’d been missing out by limiting my turnip eating to winter. Winter turnips are softball size or bigger, gnarly and thick-skinned on the outside and topped with coarse though still tasty greens. Spring turnips are tiny in comparison, golf ball size and smooth, round and white, thin-skinned with tender green tops. 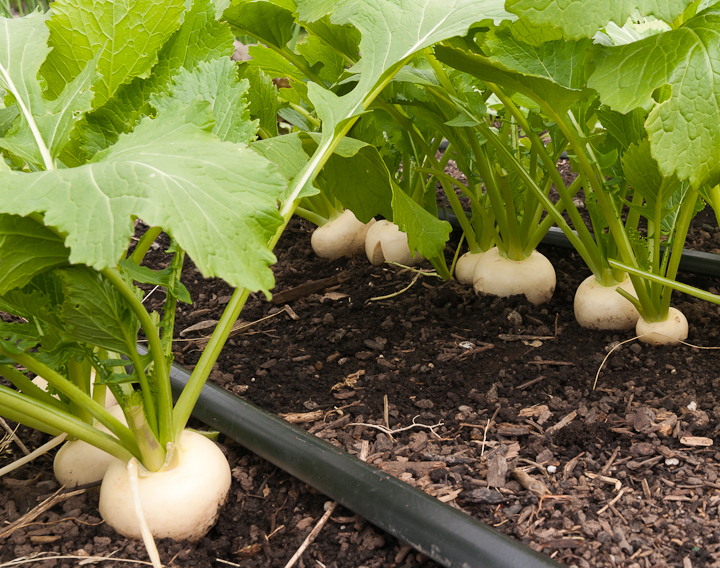 I plant winter turnips in mid-July and they mature by early October. In our marine climate, they hold in the ground all winter, getting sweeter with each frost. Spring turnips, I found, can be planted just as the winter turnip harvest is ending. I planted the first crop in early March this year and another in late April. The March planting was ready to harvest by early May and the April planting was ready even sooner, early June. To minimize root maggot and flea beetle damage, I covered the just planted seeds with Reemay and kept the germinated seedlings and then maturing plants covered until they were nearly ready to harvest. I planted the seeds about an inch apart and began thinning and harvesting turnips when they were an inch across. Those that stayed in the ground grew quickly to two inches across. Encouraged by Alice Water’s recipe for roasting spring turnips in her Chez Panisse Vegetables, I roasted the first harvest of spring turnips. After cutting off the greens but leaving two inches of stem, I cut the turnips in half, lightly brushed them with olive oil, sprinkled on a little salt and roasted them at 425 for about fifteen minutes. As one of my friends said after a mouthful, “these melt in your mouth!” Another added, “These are my new favorite vegetable!” Mine too! 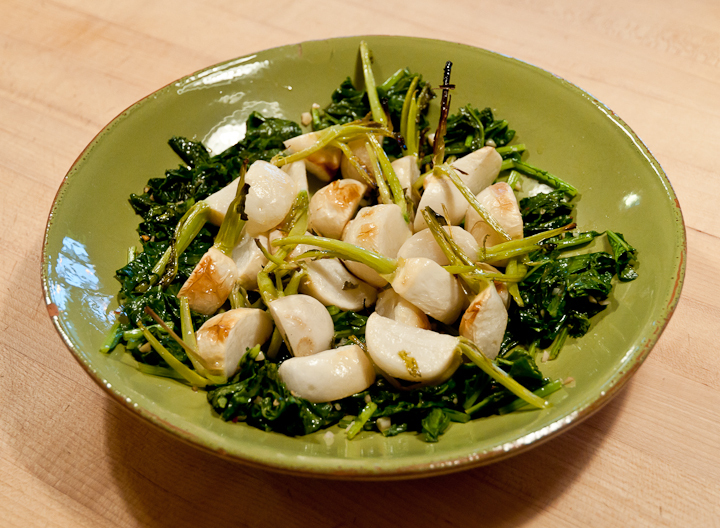 The flavor is light and delicate but still carries the earthiness that makes winter turnips so appealing. And then there are the greens. I understand now why people grow turnips just for the greens. Sautee them in olive oil, garlic and red pepper flakes. They wilt down and finish cooking very quickly, releasing the expected mustardy fragrance but also the surprising fragrance of corn. They are delicious on their own or as a bed for the roasted turnips. So next year, I’m planting more varieties of spring turnips and looking forward to more kitchen discoveries. Suggestions? Favorites? Let me know. This entry was posted in Spring Vegetables and tagged turnips by Lopez Island Kitchen Gardens. Bookmark the permalink. Hello, that dish of turnips and their greens looks wonderful. Being from Texas originally, I ate a lot of the same ingredients but cooked until they were a soft mush. It’s the way most vegetables in the south were cooked. I’ve always loved Hakurei, raw or cooked. I was just admiring a picture of Scarlet Queen Red Stems in the Johnny’s catalog…maybe next year. This blog is inspiring!! Those Scarlet Queens are beauties! Yes, next year. Thanks! I am inspired to rush to the nursery for turnip seeds! I always lose my radishes to the root guys, so I’m also happy to hear about covering the plants with remay. Thank you so very much for sharing your experience! Thanks, Lyn! I’m thinking of trying a row or two of these Oasis turnips this fall, perhaps planting them at the end of July or in early August.